Arunachal Dy CM Chowna Mein inaugurated Steel Girder Bridge over river Panior on Sagalee-Sakiang road under Mengio Circle. 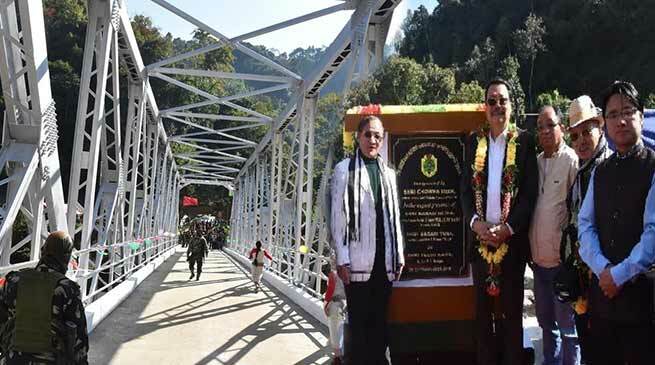 Deputy Chief Minister, Chowna Mein inaugurated a new Steel Girder Bridge over river Panior on Sagalee-Sakiang road under Mengio Circle in presence of former Chief Minister, Nabam Tuki and Itanagar MLA, Techi Kaso today. Attending a public meeting during the inaugural function, Mein said that the real development is achieved when we connect the interior places. He said that the Govt is committed for development of all the interior areas of the State and it is in the priority of the Govt to give connectivity to the remote and interior places in order to bring all round development. He added that it is through such developmental works, we can arrest the migration of the people from the villages in interior areas to the towns and cities. He informed that under PMGSY, rural roads of worth Rs 2000 Crore will be constructed across the State which would further improve the road connectivity in rural areas when completed. He also informed that the up gradation and maintenance of rural roads across the State will also be taken up by the Govt. While citing that many road projects are being implemented in the State, he said that Frontier Highway which is in the pipeline would further connect the border villages. He also stated that the proposed Industrial Corridor along the foothills from Bhalukpong to Kanubari would accelerate the economic activities in the State. While lauding the local Contractor, Tarh Kena proprietor of M/S Haniya Enterprise for completing the Steel Girder Bridge over Panior River on time despite natural disturbances and washing away of construction materials due to landslides and floods, Mein said that the Govt would encourage more such committed local contractors to come up in the State. Responding to the 4 points memorandum submitted by the Former Chief Minister, Nabam Tuki, who is also the local MLA, Mein assured to take up the matter with the Ministry of DoNER for the proposed construction of road from Marung-Gika to Panior Bridge point via Sarch Gai, Mate, Kusu & Pan – 21 km in Papumpare District under North East Special Infrastructure Development Schemes (NESIDS). He also said to look into Construction of Steel Bridge over Panior River to connect Bong Village, construction of slope stability structure to protect road formation near Steel Girder Bridge over panior river on Sagalee-Sakiang road (which was inaugurated today) and construction of Steel Bridge over river Nyorpung to connect Paga Village in the next financial year. Tuki while submitting a memorandum to the Deputy Chief Minister informed that Mengio is one of the most interior administrative headquarter of Papumpare District and such developmental works will bring economic benefit to the people of the remote areas. He also called upon the people to co-operate with the Govt in smooth implementation of developmental works and to take up minor repair and maintenance works like filling up of potholes in self help basis saying that we can not depend on Govt for everything. Earlier, G Padu, SE(PWD) Sagalee highlighted the description of the bridge. He informed that the 75 meter bridge was constructed under RIDF/NABARD with an estimate cost of Rs 600.00 lakhs. The bridge will connect Mengio to Sagalee via Silsango & Pila Villages and will shorten the distance between Itanagar to Mengio by more than 10 km and reduce the travelling time by more than one hour. DCM also laid the foundation stone of 19 Crore PMGSY road from Sakiang to Nargang (18 km) which will connect 7 villages when completed. Earlier, DCM also inaugurated the SBI Customer Service Point in the premises of EAC Office, Mengio and handed over the first pass book opened through the CSP on the occasion. This CSP will provide financial services like opening of new bank accounts and the facilities like online filling up of forms for PM Jandhan Yojana, PM Jeevan Jyoti Yojana, PM Jeevan Suraksha Yojana, Atal Pension Scheme and other G2C (Govt to Citizen) services like ST, PRC, Income Certificate, Dependency Certificate, PAN Card, Passport, etc. On the occasion, Commissioner (PWD), Bilatee Pertin, Chief Engineer PWD (WZ), K Waghe, DC Papumpare, Dr Joram Beda, SP, Tumme Amo and Dominic Tadar, General Secretary State BJP were present among others.